Preheat the oven to 400° and line 2 baking sheets with parchment paper. In a large bowl, combine the all-purpose and whole wheat pastry flours with the granulated sugar, baking powder, baking soda and salt. Using a pastry blender (or two knives), cut in the butter until the mixture resembles coarse meal (little pebbles? — never know how to describe this). Stir in the 1 1/4 cups of buttermilk and carefully fold in the sliced strawberries. (I needed about 1/4 cup of extra buttermilk to get the mixture to come together, but keep in mind that this will not be a wet dough). Using an ice cream scoop or a spoon, scoop the dough into 16 mounds on the prepared baking sheets. Brush the scones with buttermilk and sprinkle with the turbinado sugar. (Why? Because turbinado sugar makes the tops of the scones all crunchy and fantastic.) Bake in the upper and lower thirds of the oven for 30 to 35 minutes, until the scones are golden and cooked through; shift the pans from front to back and top to bottom halfway through baking. Let the scones cool on a rack for 30 minutes. Lower the oven temperature to 350° (or, heat up the toaster oven to 350°). 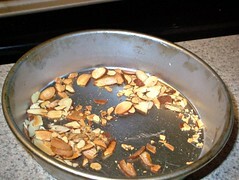 Spread the almonds in a pie plate and toast for about 8 minutes, until golden. (Watch carefully, as once you smell the nuts, they're already burned.) Meanwhile, in a small bowl, whisk the confectioners' sugar with the buttermilk, almond extract and salt. Cover and let stand at room temperature. 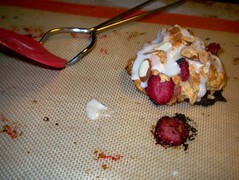 Drizzle the scones with the glaze, then top with the almonds, pressing to help them adhere. Let dry for 10 minutes, then serve. Note: The original recipe had slightly different quantities of confectioner's sugar and almond extract than what I've listed above; I've adjusted based on our experience with this recipe, but you're more than welcome to use the original quantities!